Ever wondered what makes celebrities look that good? Are they really born that pretty? Well, airbrush makeup is the hack that can make every ordinary face look alluring. If you look for the best airbrush makeup kits, they might cost you about $200 or even more. We made you a list of affordable airbrush makeup kits that make you look elegant, and which will serve you the same as something more expensive. Let’s first go over the guide to choosing kits, and then discuss the products. No matter what your complexion is, you can enhance it with airbrush makeup. Professionals have been using these techniques for ages, so you simply need to know what you need. You must have used traditional makeup and would like to know how it differs from airbrush makeup. Well, as for the similarities, both of these types can be used to make your skin look flaw-free! However, airbrush technology is lighter so you keep weight off your face. The use of a traditional makeup kit is similar to conventional coverage products. These include using concealer, foundation and powder. You can use all of these with your fingers, brushes or sponges. Though traditional makeup helps to create an even finish, it thickens the consistency. This type of makeup comes in layers and takes more time to give you accurate results. On the plus side, there is a huge variety of color shades for traditional makeup. Women born with unusual skin tones can easily adopt this type and match the pigments of their skin. An airbrush makeup kit comes with numerous tools, the main ones being the airbrush gun and air compressor. You use this to apply the airbrush foundation. Since the foundation is applied with the gun, the consistency has to be thin. It will feel like mist on your skin, as it adds a thin coat on your face. One of the best reasons to try airbrush makeup is because it blends into your skin like natural complexion. We feel that everyone who is tied down by traditional cosmetics should go for a changeover! How to choose the right airbrush kit? Single Action: when you use this nozzle it works like a hairspray. You only need to press it down and then release the pigment. Dual Action: push this down for air and pull it back to add makeup. This is more frequently used in the world of cosmetics. Artists find these easier to deal with, as these have better control over the imprint. This type of airbrush lets you choose the perfect stroke size and control the flow. When you buy an airbrush you need to also consider the feed. It will help you control the movement of your brush. The best type to choose is the ‘gravity feed’. This lets you pull the color down near the tip of the nozzle. It also lets you add less pressure and use more precision. If you are a makeup artist or enthusiast, you will know the importance of controlling makeup. The gravity feed will let you detail better! The siphon feed is another type. This lets you pull the paint towards the nozzle, but you have to add more pressure to make it neat. These feeds are more common for women who spray tan, and usually avoided for regular cosmetic requirements. You need to check the pressure when you buy a compressor. Check for pounds per square inch, and research if it meets cosmetic guidelines. The metric control will tell you how the pigment will project. Smaller PSIs suggests detailed touch, and vice versa. When you use airbrush makeup only for the face, the PSI should range within 30 to 40. If you need it for the body, you would need up to 70. Sometimes, you can use the one for the face on your body, provided it comes out as expected! Alcohol-based foundation: this is the least used process, but it is known to stay for the longest period of time. You can literally keep it for 5 straight days! However, it is not good for regular usage as it’s based on alcohol. But it stays true to the color tone, no matter how long you need to keep it. Silicone-based foundation: this is more popular compared to the alcohol-based makeup. Their greatest effect is blending into the skin tone impeccably. This stays for hours, but not as long as alcohol-based foundation. Silicone-based makeup has a special reaction when it touches our skin – our skin instantly produces moisture and embraces the intruder. The silicone doesn’t let our skin break down the makeup – it simply doesn’t dissolve! This also tends to darken after you apply it, so try out one shade lighter than what you really need! Water-based foundation: it gives you a matte finish and gets you photo ready! One of the best choices for news anchors, television personalities, etc. This form of makeup doesn’t react to the moisture of our skin. However, because it gives our skin a matte finish, it makes us look unnatural. You have to apply the makeup all over your face and neck to blend your skin tone completely. This will leave no demarcation between the real skin tone and foundation. This makeup will also get darker, which is why you need to experiment different shades before choosing the ideal one! If you apply the airbrush foundation properly, it will be way lighter in weight than your traditional approaches. If it ever comes out heavy on your face, you would know that you applied excessively! Don’t keep pulling on the trigger when you apply this form of makeup. Just go with the flow and smoothly cover your facial features. Once you get yourself the desired airbrush kit, you might want to experiment different ways to adjust to it. Don’t start mixing up the formulas as you’ll be heading for a disaster! The airbrush formulations start drying at different rates. When you combine these, it results into a mess and leaves you far from an even tone! The airbrush, compressor and makeup are the main components of your kit. However, you can add some more for better results. If you want to augment the airbrushed skin tone, you can use a highlighter, shimmer or blush bronzer. These light-weight products add more dimension to a face. Blushes and bronzers are often used for cheek contouring, while highlighters and shimmers add a dewy sheen along our cheekbones or brow. Some women prefer anti-aging primers to give a smooth look to their wrinkling skin. The Art of Air Cosmetic kit is the perfect addition to your dressing table or to have makeup on-the-go. 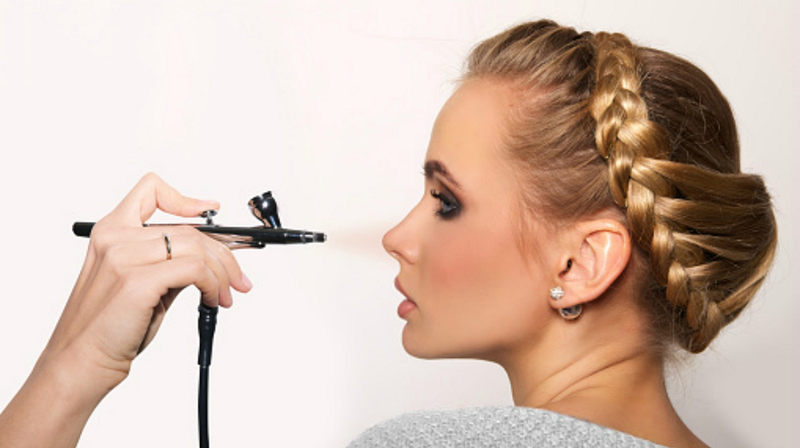 If you are a beginner to airbrush makeup, this could be the right choice. The package comes with one Super Quiet Mini Airbrush Compressor for adjustable airflow and controlled settings. It has a 6 ft push-on rubber airbrush hose and also a holder. It has a Single-Action Gravity Feed Airbrush,and the tip size is 0.4mm, while the cup is 1/16 oz. The foundation is perfect for fair to tanned skin tone, and comes in 6 bottles that have ½ oz content. The color shades are Golden Olive, Honey, Sand, Buff Beige, Moca and Suntan Glo. You also get an Anti-Aging Primerof ½ oz content, and you need to apply it before the foundation. You also get a Tropical Bronzer of ¼ oz content, which enhances your cheeks and eyes, to provide a radiant glow. There is a Papaya Blush which contains ¼ oz of this makeup for a perfect pigmentation. It gives our skin a natural-looking tone. There is also Pearl Shimmer Highlighterof ¼ oz to make your skin glisten. You can use this on your face, body, cheeks and eyes. The name suggests that this airbrush makeup kit will make everyone look photo finish. This is perfect for personal and professional use. There are 5 foundation bottles of ½ oz each. The color tones are Fairly Light, Medium, Golden, Light Tan and Medium Beige. They work well for fair to medium complexion. The pack includes Neroli anti-aging primer of ½ oz content. It comes with an exclusive Lilac Camouflage for adding incredible coverage and adhesion with a purplish hint. You can cover signs of aging, dark spots and circles. There is also a Pearl Shimmer highlighter of 0.2 oz content for bringing out the best of facial features. It gives skin a pearl-like effect, and you can apply it on your cheeks, eyes and body. You also get a Silica Finishing powder for removing fine lines for an optical blurring effect. The Dinair airbrush makeup kit has been used for celebrities for over 30 years already. You can now bring their expertise at your doorstep and get their look! Dinair’s foundations are one of the best to choose, as they are water-resistant, paraben-free and silicone-free. These go well with all skin types and give you the coverage you desire. There are 3 multi-purpose shades of ¼ oz. There are Dark Peach Glamour for lips/blush, Light Smoke Glamour Highlighter/Eye-shadow, and Light Bronze Shimmer for Bronzer/Eyeshadow. You get 1 Moist & Dewy face moisturizer of 3 oz. This is innovatively manufactured with the goodness of olive extract. It softens skin and makes it glow. This was the very first portable, cordless and rechargeable Airbrush! Mineral Makeup is a Japanese brands that added a finer touch to the revolution of makeup in this genre. These products can give your skin a seamless coverage in no time. It can not only remove signs of aging, but also let you hide permanent tattoos! There are no aerosols, hose or heavy compressors in this kit. This kit is perfect for women who are always on the go. It works for every skin type and doesn’t irritate the skin. It is made with oil and hydrating plant extracts. The products are free from parabens, talc, gluten, phthalates, synthetic dye, synthetic fragrance, BHT and BHA. This is just an airbrush kit which comes without the makeup. Assuming that you can buy your brands separately, or you already possess your products, this is only a high-tech airbrush kit. The trick is to follow the guides to know how to assemble the elements and make use of them. Now we are done with describing the top options so you can start choosing what you need. Hopefully, you will love this over your traditional makeup and give yourself a redefined look!